From 1837 to 1901 Queen Victoria presided over the world's biggest empire - and during her 64 year reign approximately 1,100 judicial hangings were carried out in Great Britain and Ireland - the execution of William Perrie on the 18th of October 1837 was the first Scottish Victorian hanging. A broadside ballad (a form of popular song often reporting dark or salacious deeds,filling the place occupied today by the tabloid press) inspired by the execution begins: 'The morning came, the hours flew past:- / Yea, the fatal hour, poor Perrie's last, / Drew near, on which he was to die, / And meet his God, his Judge on high.' Under the title a small quotation has been provided: '"He died, as erring man should die, / Without display, without parade." William Perrie was a native of Glasgow, but at the time of the murder had resided for eight years in Paisley. He was a tobacco-spinner by trade and was generally described by those who knew him as a quiet inoffensive man. However, Perrie was without a doubt a dangerously jealous man when it came to matters of the heart. Twice married, his first wife was described in contemporary reports as 'a respectable woman' who 'always conducted herself with propriety'. Despite this Perrie continually jealous, 'keeping up a constant espionage upon her motions, and finding cause for suspicion where none such existed'. Newspapers of the time recount an episode where at a party where Perrie was playing the violin to the company, his wife was asked to dance by one of the guests. Perrie was immediately seized with a jealous rage and springing from his seat, he tore his wife from her partner, and broke the bow of his violin over her head. This and other instances of Perrie's jealousy no doubt led the end of his first marriage. 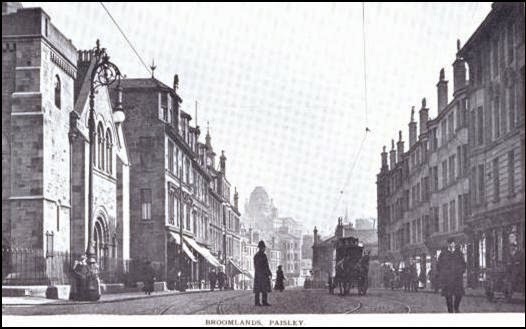 His second was to a woman 'of light character' (read: a flirt) who had already borne several children to another man in Paisley. Although Perrie was aware of his wife's chequered history before he married her, he made her promise that she would give up all association with other parties. He was described to have been infatuated to the point of obsession with this woman and his tendency to jealousy was exacerbated by her tendency toward flirtation although he had no real reason to conclude that she had ever been unfaithful to him. No doubt frustrated by her husband's unending charges of infidelity, it was said that she used to taunt him and was in the habit of hinting that some cause existed for his suspicions. His friends also used to amuse themselves by hinting that all was not right at home, and by jokes and insinuations. One the day of the murder, Perrie left his workshop at an earlier hour than usual and returned home. After dinner he dismissed his two children (which he had by the first marriage) and having then bolted the door, he began to accuse his wife of infidelity which she denied. During the scene, he got up in a fit of ungovernable passion and stabbed his wife several times with a small file, with which he used to polish the head violins: she died almost immediately.